Selling with IMPACT: a guide to selling disruptive technology. If you subscribe to current research, buyers are contacting vendors at somewhere between 60-70% of the way through their buying process. What this research fails to mention is this only applies to mainstream technology that is in established markets and where there is an identified and known set of competitors. There are the Early Adopters (EA) who are happy buying innovative solutions. There are the Early Majority (EM) who want to buy the market leader. And there are the Late Majority (LM) who want to buy a commodity at the cheapest price. Here is where the buyer starts to engage in terms of the IMPACT process. Early adopters will enter the buying process at 10-20% of the way through a buying process and laggards will wait till they are 90% of the way - and all they care about is price or the service discount. Successful entrepreneurs, marketers and salespeople selling disruptive technology must learn to recognize early adopters, understand how early adopters engage with innovative technology vendors and how they manage a buying process. 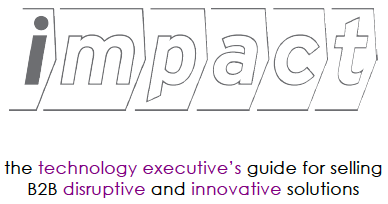 This is the subject of a new eBook from authors of “Why Killer Products Don’t Sell”, Ian Gotts and Dominic Rowsell, and Adrian King, entitled “IMPACT - the technology executive’s guide for selling B2B disruptive and innovative solutions”. If you were to interview entrepreneurial high-tech CEO's having just sold their companies, or less than successful CEO’s who wound them up, they would provide a great source of information; however their reflections could sound like a lyric from Frank Sinatra's "My Way", “Regrets, I’ve had a few". Underachievement of potential is an opinion many investors will have reached on exiting their high-tech investment. In a conversation with Nic Brisbourne, investment partner at Esprit Capital Ventures in London last week, we concluded that the principal factors causing underachievement are generally people, not product related and the root cause is nearly always poor sales and marketing execution. In hindsight CEO’s will generally agree that they should have made changes earlier and knowing what they know now, can tell you what they would have done differently. But what if entrepreneurs had a method or set of best-practices that were proven to create early sales and marketing success in both startups and new product introductions in high-tech companies…would this change the odds of survival and over/underachievement and the value of the company on exit? 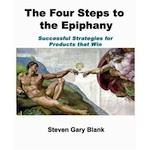 I believe it would and am currently reading and absorbing the wisdom and knowledge captured in Steven Gary Blank’s “The Four Steps to the Epiphany”, subtitled "successful strategies for products that win", a book about building successful high-tech companies. Blank is better known in the US than in Europe, having started 8 companies in CEO or Marketing roles, five of which were IPO’s including names you may remember: E.piphany an enterprise software company, Ardent a Supercomputer company, two semiconductor companies MIPS Computers and Zilog and according to Blank, three very deep craters. Blank teaches entrepreneurship and Customer Development at UC Berkeley’s Haas Business School, in the Colombia/Berkeley MBA program and at Stanford University at the Graduate School of Engineering. Customer discovery is about finding out if there are customers for your idea and if and what they would be willing to pay for it, before you write a line of code. This must be done by "getting out of the office" and talking to real potential customers and of course this removes the guess work in initial product specification - as the spec. is the founders vision and the minimum working set required to win first customers (or earlyvangelists as Blank calls them). Customer Discovery removes pricing risk because prospects tell you what they would be prepared to pay and it removes the hiring and market failure risk of alternate approaches, including the popular "build it and they will come" start-up strategy. I strongly recommend Ash Maurya's Lean Stack approach to developing astartup business model and minimum viable product, whether doing astartup or incubating a killer product in a large company. Customer Validation creates a repeatable sales and marketing road map based on the lessons learned in selling (not giving it away) to the first early customers. These first two steps validate the assumptions in your business model, that a market exists for your product, who your customers will be, the target buyers, establishes pricing, sales process and channels strategy. 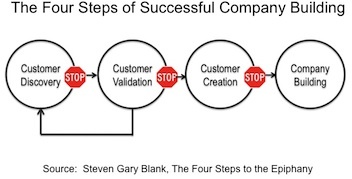 Customer creation builds on early sales success and after completion of Customer Validation. Blank states that customer creation is dependent on the market entry type which is governed by the nature of the product - is it a disruptive innovation or a me-too. Company building is where the company transitions from its informal learning and discovery oriented Customer Development team into formal sales, marketing and business development teams to exploit the company's early success. If you are an entrepreneur or a sales, marketing or business development leader responsible for introducing new products or services, then this book is a must read. If you click on the book cover above it will take you to Amazon.com where you can order it. If you are interested in the history of Silicon Valley and the birth of the modern venture capital business, you could watch Steve Blank's one hour video on The Secret History of Silicon Valley...its fascinating and a great presentation. Differentiation vs Competition and How to Achieve it. Working with a number of VC's over the past 5 years, I have completed several sales due-diligence assignments. I've developed a healthy respect for the experience, insight and skill that VC's invest in due diligence, prior to making a decision to fund an early stage company. Most VC's will see more than 100 opportunities a year and invest in a handful, representing the combination of best teams, best products, great business cases and a market receptive for the products. Ask any VC about their portfolio; most will tell you they have a couple of stars, a whole bunch that are mediocre performers and a few that are dying or that they will wind-up. Is this Darwinian or the hidden hand of some great technology creator? What happened to that great investment? If the due diligence was correct and the product works and there is a market, how come there are so few stars and so many companies struggling to win new accounts after the founders handed over the selling to the professionals? What if anything can be done about it? Our business is in improving the performance of early-stage and mid-sized technology companies through aligning sales and marketing messaging around the buyer; creating transparency in sales process; and in teaching people to sell consultatively and to disrupt status-quo thinking. 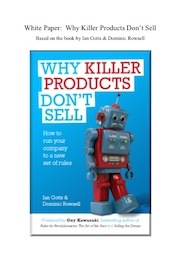 I was delighted to find and read in "Why Killer Products Don't Sell"by IanGotts and DominicRowsell, a clear and logical explanation of why so many early-stage companies get it wrong. On an assignment in an early-stage software company last week, with the book fresh in my mind, was not surprised to learn they had hired and fired 5 sales people in the prior 3 years - none of them could sell their product. There are no competitive products with the same functionality; the founders are still making sales and stress levels are high. It's a big-ticket product/consulting sale into mobile-operators and requires industry knowledge and contacts, product knowledge, product-usage knowledge, skill in managing the people involved in the decision cycle and most importantly - patience. So many companies with novel products make the same mistake. It goes something like this; - after the founders have made the first few sales, the owners decide it's time to hit the gas. They raise a funding round to ramp sales against an aggressive target; hire a sales director and team of proven sales professionals. WARNING! Did anyone specify these sales people will look more like consultants; that they need early-stage or start-up experience; are comfortable calling-high and having business conversations with senior execs about their problems (consultative selling). 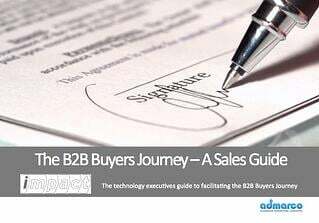 In addition, are they capable are of guiding the buyer to envision how they could achieve success using the product and then leading the buyer through their own internal machinations in order to reach a decision and start the buying process? You confuse your customer and you have internal arguments about whether you are a consulting company or a product company...(this is irrelevant, to your customers you are a product company). ....does any of this sound familiar? One very clear message from the book for VC's and leaders of early-stage companies is to understand and align with the buying behavior of their customers. "The value-created buying culture occurs when the customer senses there is an opportunity, but can't describe it. It takes the supplier to bring it into clear focus and suggest a solution." 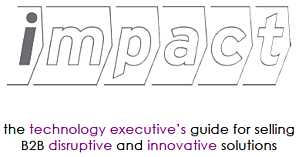 Authors Ian Gotts and Dominic Rowsell have created the IMPACT model, which accurately describes the process of how all companies buy.